"Does this offend you? What if you see the Son of Man ascend to where he was before? The Spirit gives life; the flesh counts for nothing. The words I have spoken to you are spirit, and they are life." Jesus' Sermon on the Mount laid the guidelines for discipleship and for following His teachings on love and humility, but some who heard did not believe or understand. 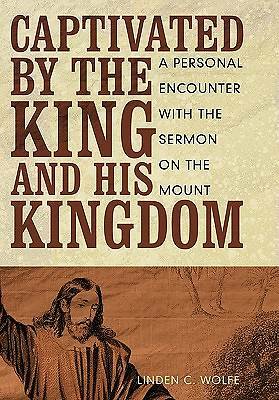 In Captivated by the King and His Kingdom: A Personal Encounter with the Sermon on the Mount, author and pastor Linden C. Wolfe offers insightful, accessible commentary to help readers see the truth of the words-for some, hard words indeed-that Jesus spoke on the Mount. Wolfe approaches Christianity's most famous sermon with a verse-by-verse exposition of Matthew 5-7, where Jesus presents to His followers His kingdom of hope, love, peace, and greatest reward, and describes to them how to live with God in their hearts. After discussing each verse, Captivated by the King goes on to inspire readers to make the message relevant in their lives and experience its transforming power. Jesus' teachings from the Mount were difficult for the prideful to accept, but He was clearly showing what it means to serve as a follower of Christ and live in His kingdom. Wolfe, through the Sermon on the Mount, asks readers to think deeply about their role in the kingdom of God and become true disciples of Jesus.